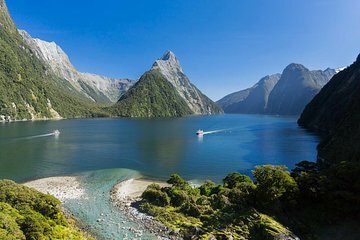 No se pierda la oportunidad de tomar un crucero de Milford Sound mientras visita el Parque Nacional de Fiordland, declarado Patrimonio de la Humanidad por la UNESCO. Partiendo de Milford Wharf, este crucero en bote atraviesa el Pico Mitre cubierto de nieve y las cascadas que caen en cascada hacia las montañas escarpadas que se elevan directamente desde el agua. Vea Bowen Falls, Stirling Falls y Seal Point mientras busca en el fiordo profundo la vida marina, incluidos los delfines y los lobos marinos de Nueva Zelanda. Ver delfines y focas en su entorno natural. Diríjase al centro de visitantes de Milford Wharf y aborde el barco para su crucero por Milford Sound. Mire por las grandes ventanas de observación de la embarcación o diríjase a las cubiertas exteriores para observar la vida marina de la Isla Sur, como los delfines, focas y pingüinos en lo que Rudyard Kipling describió como la "Octava Maravilla Natural del Mundo". Mientras navegas por el lado sur de Milford Sound hacia el mar de Tasmania y regresas por el lado norte, tu tripulación describe las características naturales como las cataratas Bowen y las cataratas Stirling que descienden desde las altas pendientes hasta las aguas serenas del fiordo profundo, anidadas en el Parque Nacional de Fiordland, declarado Patrimonio de la Humanidad. Vea puntos de interés como Seal Point y fotos dignas de una postal de Mitre Peak, que alcanzan una altura de 5,551 pies (1,692 metros). Disfrute de té y café de cortesía a bordo, y disfrute de un almuerzo (si se selecciona la opción) antes de que finalice su crucero en Milford Wharf. Nice tour. The option of going to the observatory was not well explained. This was an amazing tour. I had a fantastic time enjoying the Milford Sound Cruise. Waterfalls, Fog, Drizzles, Rough waters!! Carry a rain coat when you go on this cruise.. Thoroughly enjoyed our cruise. We had perfect weather and the views were spectacular. Would certainly recommend this tour. This tour was good. We took the 10$ breakfast option and it was worth it. Milford Sound is absolutely beautiful, we went on a wet, drizzly day which meant the mountain tops were covered by cloud but the waterfalls were amazing and the scenery still spectacular. The boat was skillfully guided right under a waterfall which was thrilling for those of us who ventured to the bow. We had another bonus, maybe because of the rain, the sandflies didn't bother us at all. Worth the time it took to get there. We had a day that was bright and sunny and so the experience was less dramatic than usual, but wonderful nonetheless. Nature at its best. Got to the pickup point a little earlier to enjoy the surrounding areas of the jetty, and then the cruise itself. What a journey it was! Gorgeous waterfalls, the beautiful ocean and we were lucky enough to encounter wild dolphins making their way out to the bay. Also saw seals basking in the sun. An extremely memorable trip. Milford Sound is absolutely stunningly breathtaking!! I would give the location 100 stars! The tour itself was great, nice boat, decent food, and some good commentary. The only reason I wouldn't give it 5 stars was because it was hard to hear the full commentary while outside on the ship perhaps speakers not loud enough and the food was just average. Other than that, it was a beautiful trip, very peaceful and the captain got right up next to the waterfalls allowing for some phenomenal pictures! Quality of the buffet lunch was a bit better than average but overpriced and was served during the first half hour of the cruise 11.00 and 11.30 am. Would have been much better to have had lunch towards the end of the cruise, closer to the traditional midday meal time.